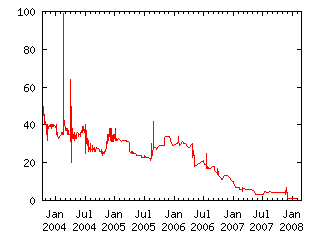 The Dollar/Yen exchange rate will drop below 80 Yen per Dollar any day on or before February 1, 2008. The source will be the Federal Reserve's Daily Foreign Exchange Rates FRB H.10 release available at http://www.federalreserve.gov/releases/h10/update/ . In 1995 the Dollar/Yen set a record low in the low 80's, it has traded mostly between 115 and 125 over the last two years. The Federal Reserve reports an exchange rate of 110.59 as of October 2, 2003. In cases of ambiguity, I will judge this claim by its intent, not its wording.